A Coney Island style hot dog chili sauce recipe perfect for your next cookout! Have you ever eaten something that you loved, tried to recreate it at home and failed miserably? Well, that’s me with hot dog chili. Mom makes one that everyone loves. Except me. Sorry, Mama. It’s a hearty chili that tastes a lot like Sloppy Joes. And y’all know I don’t like Sloppy Joes. What I wanted was more of a sauce. Like that crap in the can but made from better ingredients (like, actual meat, for instance). I always loved hot dog day in school. That chili would be so runny you’d have to eat your hot dog with a fork and I LOVED IT. I could never figure out how to get it to be not so chunky… you can only break hamburger meat down so much. Or can you? 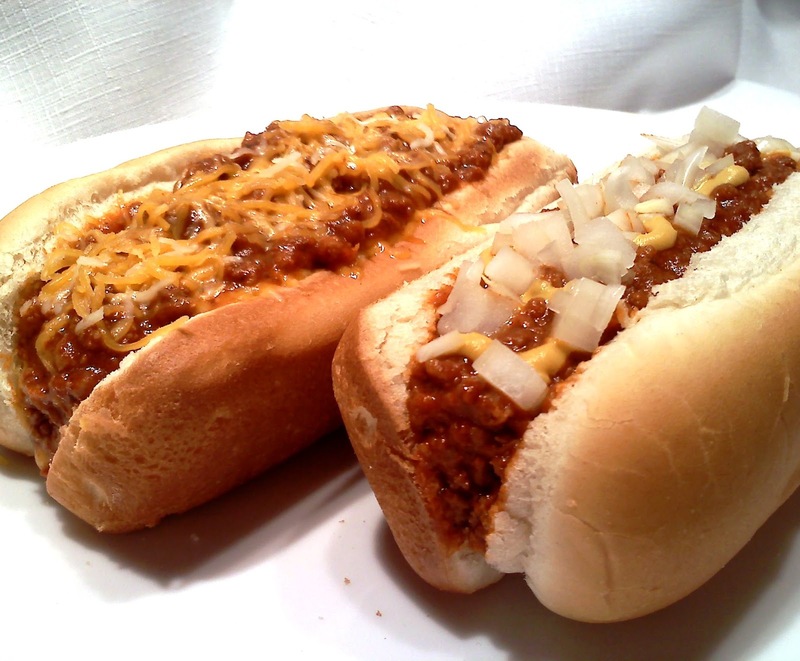 I was stalking Pinterest one night and found a recipe for Coney Island Chili Dogs. The dude put the chili in a food processor and pulsed it a few times and voila… chili sauce. BRILLIANT! So, here’s my version of it. I totally made the recipe up as I went along and, if I do say so myself, it was spot on! Oh, and I have to tell you this… I cook my hot dogs in the oven until they’re browned and about to split open. Grilled is better but since my gas grill has been dead a few years and I can’t see going the charcoal route for $3 worth of hot dogs, oven roasting is the way to go! Oh, and I also have to tell you this… Oscar Mayer RULES! I’m not a brand ho, but there are two things I won’t do without: Oscar Mayer hot dogs and Jif Peanut Butter. Season ground beef with salt and pepper and brown in a medium skillet over high heat for 5 minutes. Drain fat then return ground beef to skillet; add onion and continue cooking until meat is thoroughly cooked. Add beef and onion mixture to a medium saucepan. Add remaining ingredients and cook over medium-low heat for 20 minutes. Pour chili into a food processor and pulse 10-15 times or until chili reaches desired texture and consistency. Return chili to saucepan, cover and continue cooking over low heat until ready to serve. *Freeze leftovers for the next time you want to dress up your dogs! Wendy, do you have a recipe for sweet Cole slaw? Great idea cooking the hotdogs in the oven! Never thought of that.I usually split mine down the middle and fry them until charred and crispy. We call them burnt weenie dogs around here! Your chili sauce looks good. I like mine a little runny too, and mustard is a must. gonna try this. I use a potato masher for very fine crumb of the hamburger. That works great, you can also brown the ground meat in skillet with water which helps break down. Mandy!! I made the sauce this morning, and planned on having "one" hot dog with sauce for lunch and a salad. Yeah, the salad is in the fridge, and I went on two have my second dog. I am going to have to portion this out and freeze it before I eat all. Lovin' the blender method too! I will try this tonight! I find that cooking the beef at a lower temp helps it to break down to smaller pieces. I usually cook up ground beef in water to get a finer texture. Then, drain it and put in bags and freeze. Then, when I want to make chili, spaghetti, or some other ground beef dish, I just thaw one of the bags and add the remaining ingredients. I run the meat thru food processor right after cooking it. I do this for sloppie joes and for sausage gravy! Recipe sounds great and will try soon! Mandy, I made this last night and it was delicious. I followed the recipe exactly even though I was tempted to make a couple changes but I decided to see how it turned out first and I'm so glad I did. I've tried a few other hot dog chili recipes from various sites including one from Allrecipes that is highly rated. Even though they all are similar, I have to say this recipe has the right ingredient ratio that just works! The flavors all meld so well. This will be my go to recipes for hot dogs from now on. Thanks again for another great recipe. I make a similar chili sauce for hot dogs but it's called Michigan Sauce. My recipe calls for all ingredients to be put in the pot all at once, even the raw meat, stirred together, then cooked all together. When cooked like this the hamburger will crumble very fine if stirred occasionally. No need for the added step of putting it in the food processor. And it's even better if made the day before you eat it. If you really want to up the ante then bake your hot dogs in the bun with your chili sauce, mustard, onions and cheese for 1/2 an hour. A sweet little lady near us, had little diner that was famous for her chilli sauce. She retired and shared the recipe with me. To get the hamburger in tiny little particles, guess what she does? She puts the raw hamburger in the pot and covers it with water. Boils it, not 1, but 2 hours on low. Well simmers it really. She adds salt, pepper and chilli powder while it's cooking. She always does it in a big soup pot and I do two. I usually do it when I'm doing other time consuming things in the kitchen such as making yogurt or jelly, etc. When you get toward the end, spoon off the grease from the top. Of course, keep stirring this every so often. At the very end add ketchup and the other 3 seasonings to taste. I freeze it in quart sized bags. It's so good and tiny little hamburger particles. You basically keep cooking until it gets to desired consistency. While in high school, I worked at the local dinner and it was ran by the owners sister who was in her late 50's. She cooked it just like you describe. Everyone loved her chilli/ coney sauce. She even would sell it in quart jars. I do too, not two! I hate auto correct! Made this and it is some good! I really think I like the texture of it after it has been frozen and reheated. Thank you Mandy for posting this recipe. I could never get my chili to come out right every time, no matter how I tried. Now I can. Can't wait to try it!!!! This reminds me of when I was a teenager in the seventies, I had to have my mouth wired closed for eight weeks. One of my favorite things was to put canned chili thru a blender, then heat it and drink it. It was yummy! I grew up in Spartanburg South Carolina. As far as my taste buds go, and I'm sure it's related to what I learned to love while I lived there, there is nothing like South Carolina chili sauce for hotdogs . There is a local diner in Spartanburg famous for their hot dogs, by name of Boots and Sonny's that has, by far, the best chili sauce of any I've ever had. I no longer live in South Carolina and I have tried and tried over the years to duplicate that chili with no success. This is a new recipe, and I am anxious to try it! Let me just say - I have been making hotdog chili for years. If you will boil the hamburger in water, drain it and give it a few mashes with a potato masher or even a fork, you can avoid that food processor.